LG U+ shall make constant efforts to become ‘a company adding happiness to the world.’ In order to practice ‘A heartwarming company that connects to society through sharing,’ our vision of social contribution activities, we shall constantly share and deliver resources to places in need of interest, consideration and love of society. LG U+ rejects one-off donations and beneficiary donations and runs long-term social contribution activities and is expanding its social influence. In order to operate sustainable and trustful business, we also encourage our employees to actively participate in social contribution activities. LG U+ earnestly operates social contribution initiatives, and we wish to move the hearts of our customers and the world. LG U+ remains steadfast in dedication to social contribution initiatives through volunteer work of our executives and employees. In September 2015, we provided mobile phones with free call-receiving services to officers in the ROK Army. Like this, we take customer input seriously. Additionally, we engage in sharing initiatives that highlight our unique strengths to become a company that grows alongside our society. The ICT Convergence Town is located in Unhak 1-ri, Yeongwol-gun County, Gangwon-do Province. LTE CCTV cameras were installed throughout the village and U+ Village Broadcast and U+ TV services are respectively provided to every household and the community center. 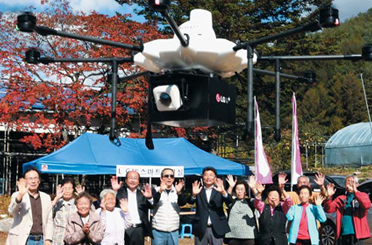 For the first time in Korea, drones can make deliveries to elderly living alone. Contributed to a safer and more convenient living environment in a rural area. 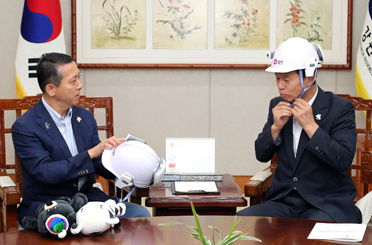 LG U+ supplied 150 IoT helmets that can be used to monitor for forest fires in Gangwon-do Province and the regions that hosted the PyeongChang 2018 Olympic Winter Games. The helmets enabled real-time monitoring to prevent wildfires and other natural disasters during the Olympic Games. Around-the-clock monitoring based on real-time footage transmitted from the helmets prevented wildfires and ensured safety during the Olympic Games. We provided 45,817 mobile phones for officers in the ROK Armed Forces to enjoy free call-receiving services to facilitate better communication between soldiers and their loved ones. In recognition of this initiative, the Ministry of National Defense presented LG U+ with an appreciation plaque on February 15, 2016. Received plaque of appreciation from the Ministry of National Defense on February 15, 2016 for assisting military personnel connect with their families and friends. 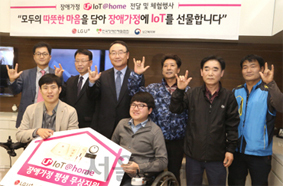 In celebration of the 36th National Disabled Persons Day in April 2016, LG U+ announced lifetime support of free Home IoT service with the sponsorship of the Ministry of Health and Welfare. Services provided include the ‘DoorCam’ CCTV service, ‘GasLock’ remote gas valve control service, ‘Plug’ remote plug control service, and the advanced voice-recognition hub. It is expected that the disabled persons having trouble moving about and communicating will now be able to live a more free and independent life. LG U+ supplied the homeBoy terminals and 3-year free educational contents service in July 2016 through the multicultural support centers. This program is expected to support adaptation of the women who migrated to Korea, and to enhance the education environment for the children of the multicultural families. LG U+ provides opportunities for customers to participate in these social contribution activities indirectly. If existing and new customers select to receive their bills via email instead of the postal service, the costs saved are used to fund the program. Medical costs covered for 1~3 children/youths with incurable diseases every month. 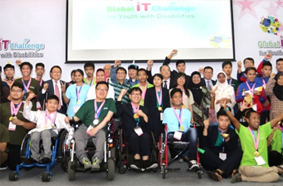 The Global IT Challenge held by the Korean Society for Rehabilitation of Persons with Disabilities is Asia’s biggest IT competition and festival and has been sponsored by LG U+ for 5 years. Disabled youths provided with the opportunity to access ICT, to develop IT use skills, and to communicate with the world to be more independent. ‘Pleasant Sharing ON+’ is LG U+’ unique in-house CSR program. Employees participate in various activities, such as the ‘U+ Love of 1,000 Won’ in which they donate 1,000 Won from their monthly pay to help neighbors and colleagues in trouble. LG U+ provides its employees with various opportunities and experiences to make meaningful contributions to various groups of the community.